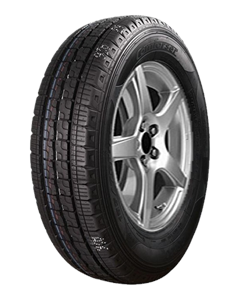 The CF300 line of commercial vehicle tyres feature a wide tread design for stable handling and increased mileage. Stone ejector grooves minimize damage to the tyres casing and shoulder protectors reduce sidewall damage caused by rubbing against curbs. A variety of sipes along the shoulder and center ribs ensure good traction in wet or dry road conditions. Commercial Van Tyre For 14-16" Diameter Rims. High Mileage & Low Fuel Consumption. Extensive Siping For Great Traction.